The Synexis IL 100 induction loop connects hearing aids to the Synexis RP8 pocket receiver in our tour guide systems, allowing hearing-aid users to benefit from the systems' famously excellent speech intelligibility. 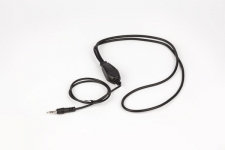 The technical principle behind the Synexis IL 100 is that of the so-called "audio induction loop." The IL 100 is connected to the RP8 pocket receiver and then laid over the listener's hearing aid. When an audio signal is sent by a transmitter (e.g. the Synexis TS8 Handheld Transmitter or the Synexis TP8 Pocket Transmitter), the induction loop generates a matching electromagnetic signal in the hearing aid...100% interference-free. Operating Principle: Induction. Connects hearing aids with the Synexis RP8 pocket transmitter in our Beyerdynamic tourguide system. Connection: 3.5mm jack (the IL 100 connects wirelessly to the hearing aid; the mini jack is for connecting the loop to the pocket receiver). Making your tour guide system barrier-free is a breeze with the IL 100; the loop works with all types of hearing aids. Transmission is wireless, purely by induction. No special connector to the hearing aid is necessary. Using a combination of tour guide systems, conventional headsets (like the Beyerdynamic DT 2) and induction loops is highly advisable, particularly when working with large groups or tours, and especially at conferences. With this setup, even listeners who use hearing aids will be able to follow the speaker's presentation in terrific audio quality. Our tour guide-system team is available to answer any other questions you may have about renting/purchasing tour guide systems; e-mail mail@Radio-Rental.com or call +49 30 29381970.